Daniel Kobialka has led a very eclectic life within the many arenas of the music world. 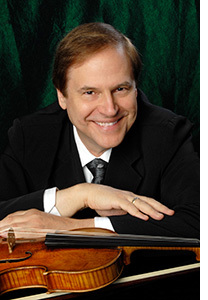 His vast career has taken him from the position of Principal 2nd violinist of the San Francisco Symphony Orchestra for over two decades, and Concertmaster, Soloist, and Founding member of the Mid Sumer Mozart Festival Orchestra in San Francisco. He was the Concertmaster from Leonard Bernstein's "Candide Stage Production" which lead to a personal invitation by Leonard Bernstein to be his Concertmaster in the Premiere Performances of his "Mass" for the Opening Of the Kennedy Center in Washington DC, and the subsequent recording on Columbia recordings. He is sought after internationally as a performer, lecturer, and composer. The Japanese Government awarded him the "Medium Term Grant" to study Japanese traditional music, and was also invited to be a principal violinist with the Nagano Winter Orchestra, comprising of musicians from all part of the world to perform for the Opening Ceremonies of the Nagano Olympic Games in Nagano Japan, February 1998. His performance and compositional influences came from his teachers, Raphael Bronstein, Robert Gerle, Jack Albert Fracht, and Raphael Hillyer. The variety of music that he performs and records was also influenced by many years of solo and orchestral performances as well as personal acquaintances with many composers he knew and personally commissioned works from composers as Lou Harrison, Vivian Fine, George Rochberg, Ben Weber, Lorin Rush, Benjamin Lees, Toru Takemitsu, and the Pulitzer Prize winning composers: William Bolcom, Charles Wourinen, Wayne Peterson, and Henry Brant. His solo performances, lectures, and solo appearances in health Centers, have taken him to major cities in the United States, Europe, and Asia. The compositions from the Kobialka music Catalogue found it origins in the early 1980's, which quickly developed into its own very unique sound, with lush orchestrations surrounding the most beautiful melodies found in the classical, popular, and folk music. Through its beauty and welcoming sounds this music has survived the test of time to now be found in the healing art arenas throughout the world, as well as the concert halls creating feelings of comfort and transcendence to all that have listened. LiSem Enterprises, Inc. was officially opened in 1985, and has served as a creative entity to develop, innovate, and explore through sound and music to assist its audiences to their inner mind and oneself. If allowed the sounds from the Kobialka Music Library can give its listeners the place for reflection, a resting place in our active lives to re-energize and gain back our productivity within the very fast pace we all face in our daily lives. We welcome your suggestions and requests, so that we can continue to progress and develop more of our musical creations to benefit all that have been our friends and new audiences. Welcome, Enjoy and Share these wonderful experiences with us.